« Is Your SEO Guy Hosing You Over? Gone are the days of paying $10 for an article that you can shoot out to a few hundred or thousand article directories for easy links. That was a viable (albeit shaky) strategy in 2010, but now it’s a total waste of your marketing money. Most of these article directories have been totally removed from Google’s index, so any link you might get will never be counted anyway. Just as the article marketing, directories have taken a huge hit since the Penguin update in April 2012. They were already being removed from Google’s index before that, so this has long been a bad strategy. There are a few good directories that are worth being in, such as Yahoo!, BOTW and DMOZ. Other than those, I’d be pretty careful about where I put my link. One of my clients just received a comment yesterday from a competitor. The comment was obviously automated, had nothing to do with the subject matter, and added nothing to the conversation. Just one minute worth of snooping around and I found out who was behind it (another local SEO guy that subscribes to my newsletter). 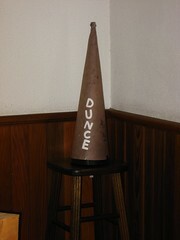 Dunce. There is something good to say about commenting on blogs, providing you aren’t automating it nor doing it specifically for promoting yourself. If you have something to add to a blog post, do it. Just don’t be spammy. Get caught doing this and you’ll get booted from Google. Plan and simple. The idea sounds good at first – trying to rank for tons of cities or zip codes by simply making a page about “Areas We Serve”. But this can actually ruin any page authority you may have had before implementing this idea. It falls under the “Over Optimization Penalty” and isn’t a good idea. If you currently have one of these pages, I recommend you remove it, rewrite it, or break it into individual pages that have actual content about that city/area. You could also have testimonials from actual clients in those areas, or provide pictures/video of you in action in that area. Unless you just want to rank for your business name, this is a bad idea. Your page titles should explain what that page is about and nothing more. Since most people don’t know that your business exists (and that’s why you’re doing SEO in the first place), why waste those 70 characters with your business name? There are exceptions, of course, but they are rare. Some businesses have branded themselves so well that they don’t have to worry about page titles or search engine rankings. If that’s you, then there’s no reason to keep reading. I’ve covered this before. I know of a large SEO company here in Saint Louis that does this, and I still don’t understand why they’d split their clients’ SEO efforts amongst several sites (unless they just want to bill them more). Sounds like he may be lying. Or he’s ignorant of the constant need to improve and test your website, but doesn’t want you to know that he’s clueless. Makes sense – promote your posts on Facebook and get more traffic from people that are already your fans, right? Not really. This great writeup explains the formula for deciding if promoting a post is worth your time. Of course there are a lot more strategies than these mentioned, but I think these are the most common. If your SEO guy is telling you to do these, I recommend you find a different SEO guy. Is Your SEO Guy Hosing You Over? Great points Will. It seems that it is getting harder and harder to get rankings without building something that garners natural links from credible sources. What is a small business owner to do? Building organic authority in SERPs isn’t easy by all means. Even more so the fact that while content is critical for brand visibility you also need to be selective about which pieces actually make it out on the interwebz. What are your thoughts on the new Disavow Links tool for webmasters? Do you find this as a good assistant for link building strategies? Is this for real? I’m from Australia where gender-specific language faded out in the 80s…or does it just reflect education levels of the poster? Yeah, Georgie, I’m a dunce too. Thanks for the comments Russ. SEO is definitely getting more difficult. Smart business owners are already doing what they should be – creating great content that earns links organically. Thanks Ivan. I’m not a big fan of the disavow tool, but only because in most cases my clients haven’t built any bad links. I’m sure it works well in the right situation, I just haven’t had it come up yet.